The Apple Watch Series 4 is a fantastic upgrade to Apple’s wrist-wearable accessory, but it’s still missing a key competitive feature: sleep tracking. Each year, we hope the new version of watchOS will add integrated sleep tracking, and each year we’re disappointed. Fortunately, a number of third-party applications pick up the slack. After trying quite a few, we think the best two are AutoSleep and Pillow. They’re reliable, attractive, informative, and best of all, they track sleep automatically. All you need to do is wear your Apple Watch to bed. AutoSleep’s primary purpose is right there in the name: automatic sleep tracking. It’s made exclusively for your Apple Watch, and it really doesn’t work at all without it. Just wear your Apple Watch while you sleep—you’ll probably want to enable Theater Mode to keep it from lighting up—and you’ll get a notification with your sleep report the following day. If you want to charge your Watch overnight, just put it on the charger right when you go to bed and stop charging it immediately when you wake up. AutoSleep will use the charge time as a proxy for sleep time, but you won’t get any details about your quality of sleep or heart rate. The AutoSleep app interface is a little confusing at first, but is full of useful data. The interface is a little hard to figure out thanks to excessive mimicry of Apple’s activity rings, but you’ll find a lot of great information once you poke around. 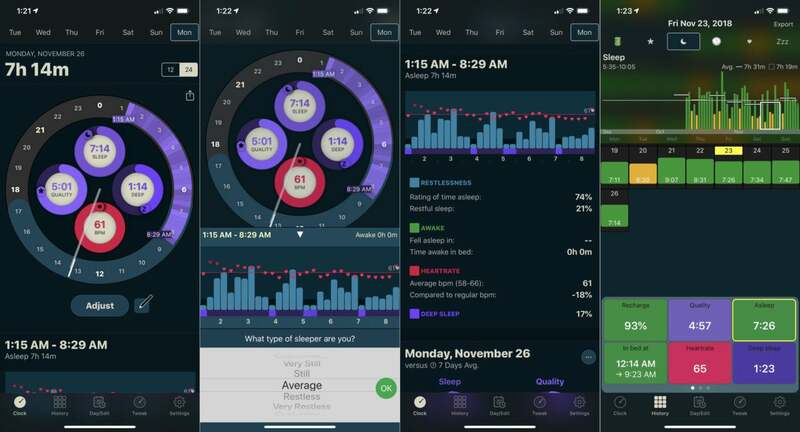 You’ll get information on when you went to sleep and when you woke up, total sleep time, amount of time spent in deep sleep, how much “quality” sleep you got, and your heart rate. Drill down further and you can find out how any one night’s sleep compares to your averages, and there’s a great log of every night recorded. AutoSleep’s Watch interface is clear, but doesn’t quite look like a standard Apple Watch app. Setup requires completing a wizard that asks about your sleep habits, including the time at which you want to start recording a new day’s sleep. After all, you don’t want to go to bed at 10 p.m., sleep for eight hours, then have the app count the first two hours of sleep on one day and the next six hours on the next. I found that I had to fiddle with the sleep tracking sensitivity a bit to get readings that I thought were accurate, but that’s easy enough to do. You get five settings from “Very Still” to “Very Restless,” and one of them is bound to match your average sleep activity level. AutoSleep provides a nice watch complication that supports the new Series 4 watch faces (including corner complications), but it does not support the new large center complication on the Infograph Modular face. The watch app itself is clear and easy to read, and the rings interface makes a little more sense there. There’s even a handy “Lights off” button that works with HomeKit-enabled lights. It’s a good deal at $2.99, and for a long time was my favorite sleep tracking app for Apple Watch. AutoSleep’s top spot has been slightly edged out by Pillow, thanks to a few features added in recent updates. Pillow is made to track sleep for anyone with an iPhone—by placing it on your mattress, an iffy proposition if you share a bed—but we’ll focus on its Apple Watch functionality here. 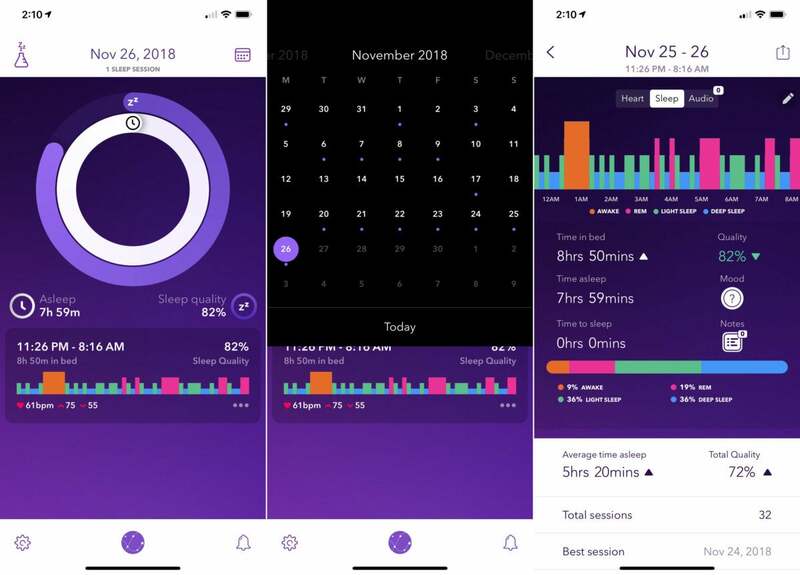 Pillow’s main interface shows a couple of sleep activity rings, followed by a simplified chart of your last night’s sleep. Tap that chart and you get more detailed info, including your total time asleep and a measurement of your sleep quality. You can see what percentage of your sleep time was spent awake, in light sleep, in REM sleep, and in deep sleep. Pillow’s app interface is more friendly than AutoSleep’s, but it doesn’t provide as much data. Turning your phone sideways to landscape orientation changes the view to show detailed information about a bunch of your sleep data over time. It’s all presented in simple and clear vertical bar charts. Pillow’s got a few other handy features, too. It will record noises at night while you sleep, and you can listen to them later in order to see if you’ve been snoring or if it was the cat that woke you up. It can suggest times to go to bed based on your sleep stats to make sure you get enough quality sleep, and play sounds that might help you fall asleep. It has an alarm mode that will wake you up during the most opportune part of your sleep cycle before you have to get up. Some of these features don’t work when you’re using the Apple Watch’s auto-detection mode, which is a shame. But even without them, it is more or less a feature-for-feature match for AutoSleep. Pillow’s Watch app looks almost like something Apple would make. The Watch app does a little bit better job than AutoSleep of matching the aesthetic of Apple’s own watch apps. A recent update also added support for the whole range of Series 4 complications, including corner complications for the Infograph face and the large center graph on the Infograph Modular face. Pillow is technically free, but it’s really not of much use without the $4.99 in-app purchase. Without that, you get a very limited sleep history, which really defeats the purpose of knowing if you got a better night’s sleep than usual. AutoSleep and Pillow are both excellent choices. Neither one is free (Pillow’s in-app purchase is all but required), but neither is expensive. Perhaps most importantly, both AutoSleep and Pillow are one-time purchases; in this age of subscription-based apps, it’s nice to just buy something and own it. Both apps gave me similar data about total sleep time, but their reports for how much “good” sleep I got or how long I spent in deep sleep were often wildly different. I get the feeling that they simply have different definitions of these things. What is more important is that they’re both pretty consistent, at least once you set them up properly and you’ve given the learning heuristics a week or two to figure out your sleep patterns. I found Pillow’s basic information to be presented in a more appealing and easy to understand format, and its Apple Watch app and notifications are great. I like AutoSleep’s charts for detailed information, but I honestly rarely drill down that deep. Pillow’s daily sleep summary notification includes a little graph, which I appreciate. Fortunately, there’s no real reason not to run both of them. The impact on battery life is minimal—the apps are basically just taking the Watch’s history of movement and heart rate data and processing that—so it’s not as if either app has to be “active” while you sleep. I successfully used both for several weeks, and never had any problem with battery life on my 40mm Series 4. A couple hours of charging in the evening is all I needed to track sleep that night and use my watch the following day. 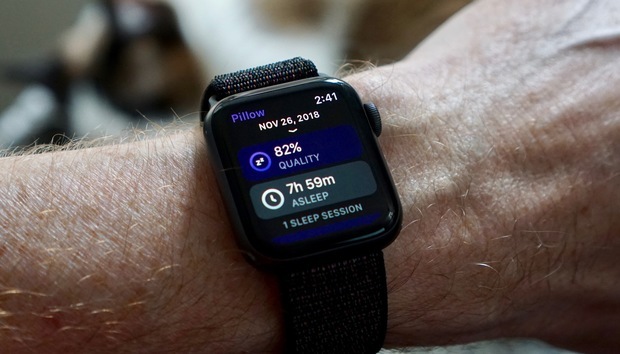 We still think Apple should provide its own sleep tracking in watchOS 6. Given all the ways Apple is using machine learning to build activity profiles, fall detection, and more, it seems like a natural fit. But until then, you can get a great third-party alternative for just a few bucks with either AutoSleep or Pillow.